For women, the idea of hair loss is a complete nightmare seeing that long hair is accepted as a symbol of a woman’s identity. From styling to blow-drying to shampooing, women spend a lot of time and money ensuring that their hair remains in tip-top shape. In North America alone, the average woman would spend $80 and 11 hours per month on grooming and styling her hair. That amounts to more than $55,000 in her lifetime. It is definitely not surprising that any form of hair loss experienced by women isn’t something that can be ignored. For some women, hair loss even leads to loss of self-esteem and depression. There can be a large number of causes behind the occurrence of female hair loss ranging from genetics and hormone imbalances to inadequate nutrition and stress. All these different causes are addressed in different ways hence it is imperative that women visit a qualified specialist in order to determine the specific cause of hair loss and treatment. Just starting a treatment method of hair loss without knowing its clear cause is disastrous. At best you’ll have wasted your money and at worst, you will suffer severe adverse effects due to the treatment method you pick. Currently, there are many treatment options available for female hair loss depending on the cause. For instance, medications like minoxidil and finasteride are effective for female-pattern baldness while immunosuppressive and anti-inflammatory medication like corticosteroids work for alopecia areata. However, most medication works best for stopping hair loss as it occurs and not regrowth of hair after the hair loss especially in female-pattern baldness. For restoration of hair after ‘permanent’ hair loss, hair transplantation is the best option. Female pattern hair loss, or androgenic alopecia, is the most common type of hair loss affecting women. Hair loss can have a serious psychological impact on women. Because of that, hair transplantation has recently been widely performed on women nowadays. Besides the studies of the female hairline have rarely found in literature. The objective of this study is describing hairline contour in women to make an ideal female hairline. 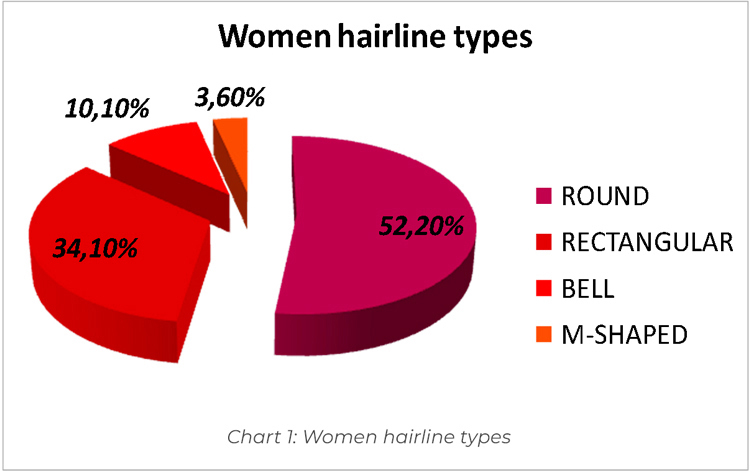 In this descriptive research, we have randomly chosen 138 females which aged 18 to 25 with no prominent hair loss (any hair loss score above ‘1’ in Ludwig scale were considered prominent) and measured specific reference points of their hairlines. All measurements were performed with a digital caliper. SPSS (Statistical Program for Social Sciences) for Windows version 15.0 was used in statistical analyses. P value < 0.05 was considered significant. The overall measurements were evaluated with Man Whitney U Test. 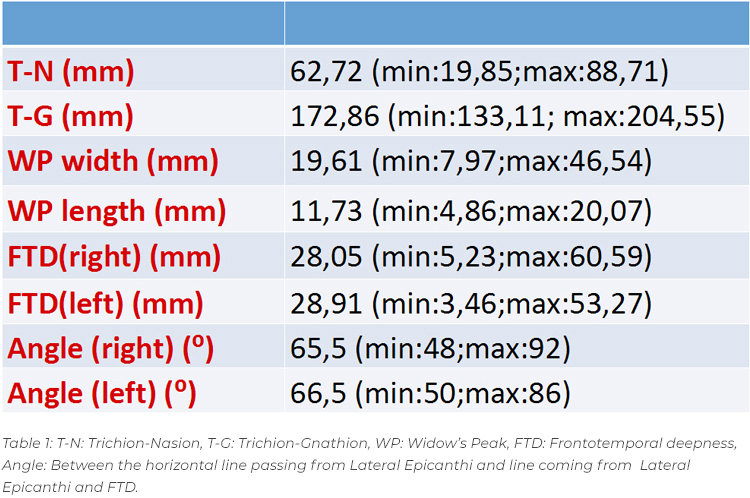 Trichion-nasion (T-N) distance, trichion-gnathion (T-G) distance, widow’s peak width, frontotemporal deepness, angle between the horizontal line passing from lateral epicanthi and line coming from lateral epicanthi and frontotemporal deepness were measured. Average length of the T-N and T-G distances were found 62,72 mm and 172,86 mm respectively. The width and length of the widow peak were 19,61 mm and 11,73 mm. Length of the frontotemporal deepness were 28,05 mm for the right side and 28,91 mm for the left side. (Table 1) And the angles were 66° for both sides. In conclusion, round shaped hairlines express femininity. When we compare of our findings with the previous research about hairline of men we also suggest that women’s foreheads make up a larger percentage of their faces in comparison to men, and the more cornered the hairline is, the deeper frontotemporal recession gets. We hope that the findings of our research will contribute the hair transplants on women which delivered more successfully. 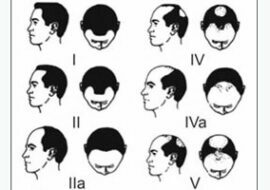 Classifications of patterned hair loss: Areview. 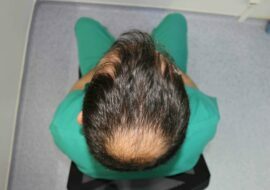 Gupta M, Mysore V.
A review of medical and surgical treatment options for androgenetic alopecia. Rousso DE, Kim SW. JAMA Facial Plast Surg. 2014 Nov-Dec;16(6):444-50. Facial feminzation surgery: current state of the art. Altman K. Int J Oral Maxillofac Surg. 2012 Aug;41(8):885-94. Despite their obvious effectiveness, hair transplant procedures aren’t as popular with women as they are with men. Unlike the blatant receding hairline and balding that men experience, female pattern baldness is more subtle with diffuse hair loss occurring gradually over a long period of time. Women therefore find it easier to hide the hair loss using weaves or wigs instead of resorting to ‘extreme’ measures like hair transplantation. Regrettably, the result is that the problem eventually becomes too noticeable to ignore or hide and by then, hair transplantation would be more expensive due to the greater degree of hair loss. Follicular Unit Extraction (FUE) is the gold standard when it comes to hair transplantation. 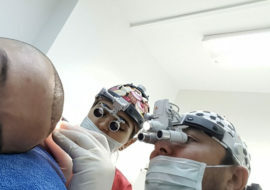 The procedure involves the extraction of follicular units (natural occurring groups of one to four hairs) from the donor sites in the back and sides of the head to the balding areas of the scalp. This technique is not only a permanent solution for female-pattern baldness but also several other forms of female hair loss. Furthermore, FUE is a minimally invasive procedure that has few surgical side effects and is associated with a very quick recovery period. It also does not require any additional stitching and barely leaves any scars at after healing. Most importantly, the subsequent hair growth from the hair transplants shows natural hair growth that is no different from the other parts of your scalp with no thinning. The only problem with FUE for women is that it requires shaving of the donor area for the follicular units to be accessible. This is undesirable for women who prefer long hair.